Coca-Cola President for Happiness first announcement is about Coke’s Blowout Para Sa Bayan in celebration of Coca-Cola's 100 years! It will take place on February 4, 2012. 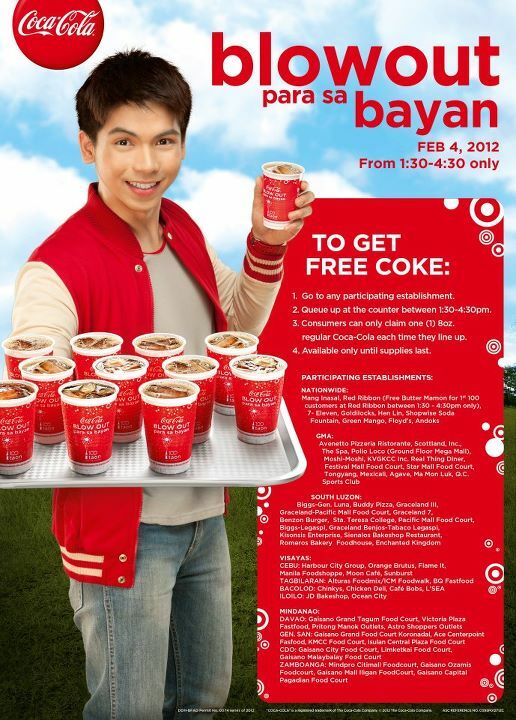 Free Coke will be given to consumers on Saturday from 1:30 up to 4:30 p.m. only. NO PURCHASE REQUIRED~! Wooooooooooooooooooooooot! Go to any participating establishment (listed below). Queue up at the counter between 1:30-4:30 PM. Consumers can only claim one (1) 8oz. regular Coca-Cola each time they line up. Available only until supply lasts. Wow Such a great ideas! that is really fun!